We also published this post on CRV’s Medium account — follow them here! As recent college grads, we have many friends in the process of transitioning from school to the workforce. Their biggest complaint? Finding relatively affordable housing in cities like SF, LA, and NYC. Most of our friends have flocked to Facebook groups and email lists in hopes of finding a group of roommates to split costs. Some (understandably) give up and move in with their parents to save money, which doesn’t carry the stigma it once did. Why is this happening? Rents are climbing faster than income in many cities, recent grads are overwhelmed with student loan debt, and finding housing on a young professional’s income is a challenge. Rising rents have pushed many to sacrifice privacy in exchange for safe but small living spaces shared with roommates. This has contributed to the rise of Common and other co-living startups, pushed developers like PMG to build their own co-living communities, and boosted the popularity of platforms like Roomi and Bedly. We’ve spent the last month looking into this communal housing trend, from co-living properties to roommate matching platforms to long-term rental marketplaces. We talked to founders of 12 venture-backed companies in the space, as well as three founders of failed companies that were willing to share their learnings with us. We also spoke with current and former residents of communal housing spaces. Big thank you to everyone who contributed! Below are some of our insights that emerged from our research — we’d love to hear your opinion (we’re at justine@crv.com and olivia@crv.com), and if you’re working on something exciting in the space, let us know! Large-scale migration to cities. A recent Forbes analysis found that educated millennials are flocking to urban areas — core cities in 33 metro areas saw an addition of 1.52 educated millennials for every one addition in the suburbs from 2010–2015. Climbing student debts. Median debt at graduation has increased by 164% since 1990, while inflation-controlled wages have increased 1.6% (Federal Reserve). A 2017 survey showed that 72% of millennials who have not purchased a home say they can’t afford to buy (Apartment List). Delay in average marriage age. Median age at first marriage has increased between 1970–2016 for both women (20.8 to 27.4) and men (23.2 to 29.5) (U.S. Census). Only 23% of 18–31 year olds in 2012 were married and living in their own household, compared to 56% in 1968. Rise of the sharing economy. Millennials are the largest adopters of the sharing economy, especially for lodging — 30% have used shared housing, compared to 11% of those age 35+ (eMarketer). 18-24 year olds are twice as likely as those 25+ to believe that access is the new ownership (PWC). 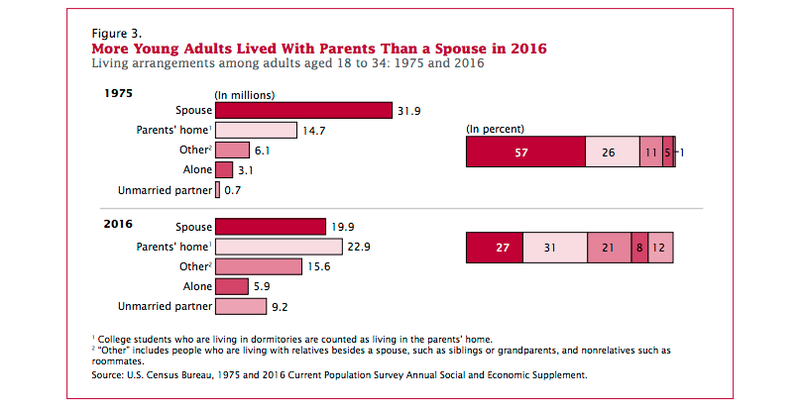 U.S. Census data reveals that, compared to 1975, a greater percentage of 18-to-34 year olds are living with their parents, roommates or other relatives, or with an unmarried partner — and a much smaller percentage are living in their own house with a spouse. What are the benefits of communal housing? We see clear value for both tenants and for landlords/real estate developers. From conversations with co-living residents and startup founders in the space, we’ve learned that the majority of tenants are single millennial professionals willing to sacrifice space and privacy in exchange for affordability and convenience. Somewhat surprisingly, the second largest demographic is people over the age of 55, many of whom are looking to downsize and adopt a lower-maintenance lifestyle after divorce or children moving out. Affordability. Living with a roommate or in a micro-studio allows residents to cut down on costs by sacrificing private space. We’ve found that co-living startups price their inventory at a 15–30% discount to comparable inventory in traditional apartment buildings. Convenience. Many co-living properties offer hotel-style amenities — weekly or bi-weekly cleanings, furnished rooms, WiFi/cable included in monthly rent, and sometimes even free food, drinks, and exercise classes. In addition, these properties are often located near public transportation. WeLive’s Wall Street location features a shared gaming room, along with free refreshments, weekly yoga and fitness events, and a whisky bar. Photo courtesy of WeLive. Flexibility. Co-living properties and sublet or roommate-matching platforms often allow tenants to sign shorter-term leases (3–6 months), while most standard apartments require a minimum 12 month lease. This flexibility is key for millennials, who are moving frequently and don’t want to be locked down. Community. Moving into a big city can be lonely, especially when you are used to the hustle and bustle of a dorm! Communal or co-living creates a community of young professionals, offering residents a built-in network of friends. Many co-living startups try to enhance this sense of community by offering a series of free events and experiences for residents. Higher ROI on space. Co-living is designed to minimize personal space in exchange for more common space. Founders of co-living startups told us that private rooms in co-living buildings are 50–75% smaller than standard studio apartments. While residents pay less for a unit, developers can fit many more units into a building, resulting in higher revenue. Therefore, co-living floor plans can enable a 50–100% premium in revenue per square foot compared to traditional apartments. Co-living startups like Ollie typically use flexible furniture (e.g. Murphy beds, expandable tables) to minimize square footage in their “micro studios.” Photo courtesy of The New York Times. Professionally managed, lower tenant turnover. Co-living companies often lease a building from a property owner or sign a management agreement. In both of these cases, the landlord benefits as there is now a professional, stable intermediary managing tenants. While tenants may turn over frequently, the intermediary will handle this, and has an incentive to keep the community calm and the building in good condition to maintain their brand. Broader pool of potential residents. By creating more affordable housing, co-living companies and roommate matching platforms allow landlords and developers to access residents who may not otherwise be able to afford their properties. This is especially true in the case of luxury buildings that are beginning to partner with startups like HomeShare and Wanderful to match roommates or add privacy partitions that increase capacity of units. We’ve seen a wide variety of companies tackling co-living, from platforms that match roommates and suggest apartments that fit their needs to startups that partner with developers to finance new co-living buildings. 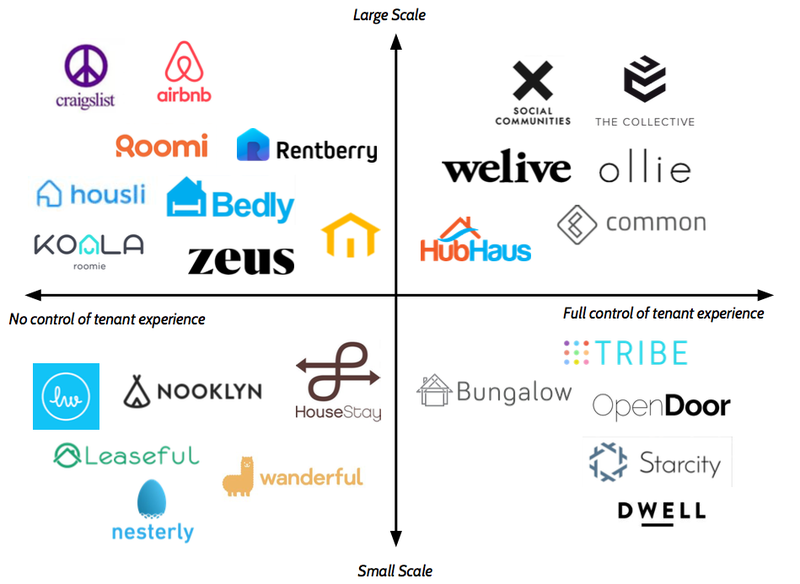 In terms of the tenant experience, we categorize companies in the space by two major features: small versus large scale communities, and controlled experiences versus free-form experiences. Airbnb, for example, falls into the large scale, non-controlled category — they have a big community of properties, hosts, and renters, and the marketplace is open so the tenant’s experience is not controlled by the company. On the other end of the spectrum, Starcity (currently)* falls within small scale, controlled experiences. Starcity operates two houses in the Bay Area, and handles everything from refurbishing properties to planning meals and events for residents via a live-in community manager. *The company plans to focus on larger, 60+ unit buildings going forward, with five such buildings in the pipeline for delivery this year. Signing management agreements for new co-living builds or significant refurbishments. Some startups sign long-term management agreements with developers — they jointly design a new co-living building (or significantly refurbish an existing space), and the developer finances the build. In this model, the startup typically collects a design fee, tenant placement fee, and ongoing management fee, without having to finance the build or take on liability for the lease, which allows them to scale more quickly. Our key question with this model is whether developers will eventually decide to squeeze these startups out of the equation and manage co-living experiences themselves — PMG has started to do this with PMGx. Real estate developer Property Markets Group recently opened a co-living building (under their PMGx brand) in Chicago. The company plans to bring online 7,000 co-living units in the next few years. Photo courtesy of Property Markets Group. Partnering with buildings to fill empty rooms and place roommates. Other startups work with buildings to reduce vacancies by matching roommates and referring them into properties. Some also increase capacity in existing rooms through temporary walls or other dividers. In this model, the startup typically collects a lead referral fee, affiliate fees through partnerships with furniture rental and other moving-related services, fees from property management companies looking to feature rooms on the platform, and sometimes even fees for handling the application and screening of tenants. We worry about the potential for disintermediation here, as buildings have an incentive to move interested residents off the platform to avoid fees. In addition, we hope to see these companies integrate themselves into the payment flow and collect an ongoing percentage of monthly rent. Co-living provides benefits in convenience, community, and quality — but cost is what really matters. 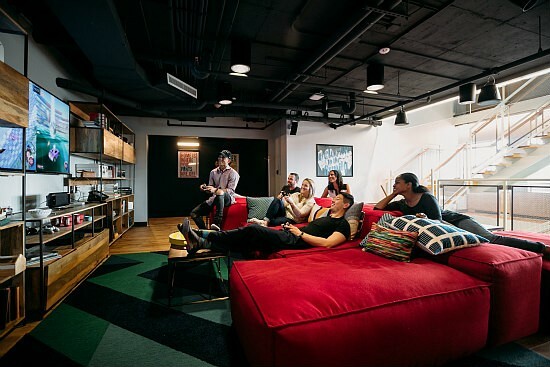 As co-living has expanded beyond the socially-focused commune model, tenants see a lack of privacy as something they need to be compensated for — even with high end amenities, co-living units need to be priced below market. The small house co-living model (<50 tenants/house) may not lead to venture returns. Smaller houses see diseconomies of scale, as designing the space, paying a community manager, and organizing events all have a fairly fixed cost. There is also a shortage of buildings that can legally be converted to a small/mid-sized co-living community at a reasonable price. Large new builds may be a better bet for co-living, but property developers could move into this space. 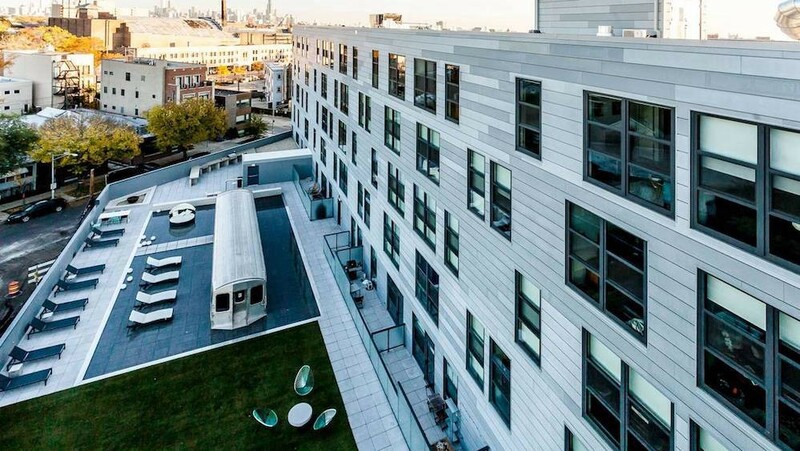 We spoke with several co-living startups that started with small houses and quickly pivoted to partnering with developers for big, new builds. However, the startup needs to add unique value to prevent developers from taking over their role. There is a need for a longer-term Airbnb, but the space is tough to enter. Incumbents (like Craigslist) have significant market share. If a startup uses their data to recruit listers, they will be sued and bankrupted (e.g. RadPad). Startups also have to tackle insurance, rent compliance, and identity verification, which are crucial for longer-term stays. The roommate matching struggle is real, but will likely not be a stand-alone venture scale business. The number of 25-to-34 year olds living with housemates increased ~40% from 2005-2015 (Forbes). Roommate matching is crucial, but difficult to monetize, as a startup can be dis-intermediated easily. Partnering with buildings may be more attractive. Thanks for taking the time to read our post! We’re excited to see communal housing develop, as we believe there are significant secular trends driving growth in the space and high demand from both potential residents and landlords/developers. If you are working on a company in this space or have other thoughts you’d like to share, please reach out — we’d love to talk with you! Our emails are justine@crv.com and olivia@crv.com.